Arthur Penhaligon is supposed to be in bed - after all, it's only twelve hours since he saved the world. But there's no time to rest. Grim Tuesday has laid claim to the Lower House and the First Key, and now his misshapen servants are repossessing Arthur's world and plunging it i... read full description below. Arthur Penhaligon is supposed to be in bed - after all, it's only twelve hours since he saved the world. But there's no time to rest. 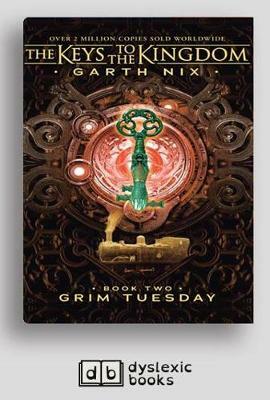 Grim Tuesday has laid claim to the Lower House and the First Key, and now his misshapen servants are repossessing Arthur's world and plunging it into financial disaster. To stop them, Arthur must venture back into the House - that surreal, unpredictable realm where he almost met his death. With companions old and new, Arthur embarks on a heart-stopping adventure that will take him from the dismal Pit of the Far Reaches, all the way to the heart of a sun and back. Racing furiously against time, Arthur must find the second piece of the Will, claim the Second Key, and save both his own world and the House from the destructive greed of Grim Tuesday. Grim Tuesday is the second book in the KEYS TO THE KINGDOM series. Garth Nix is the best-selling author of Sabriel, Lirael and Abhorsen.